NOTE: Knife is not included. 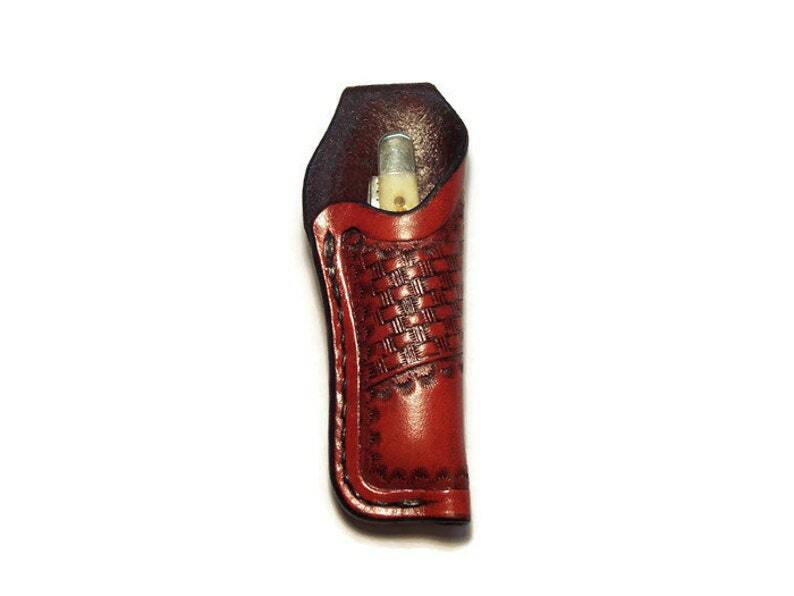 Custom leather VERY SMALL knife holster / case / sheath for a "SMALL" pocket knife. It features: Premium carving leather, hand stitched 1 1/2" belt loop, hand tooled half basket weave design, finished edges, and recessed hand stitching. (Stitching is guaranteed for the life of the item). Available in Saddle Tan (shown), Chocolate Brown, Black, Mahogany, Natural Leather with natural edging, or Natural Leather with black edging. A color chart can be found by scrolling through the photo's. Also available right or left handed on the belt at time of ordering. Fit's very small pocket knives, mini tools, and Swiss Army knives up to approx. 3 1/4" L x 3/4" W x 3/8" thick or 3 1/2" L x 5/8" W x 1/2" thick. Knives that fit this sheath nicely are: GEC Penberton, Buck 379, Buck 505, Case Peanut, Alox Cadet Swiss Army Knife, Case 6327, Case 6220, and like knives. If your unsure about the fitting, please ask as I am always happy to help. This is a make as you order item and will ship in 1-2 weeks if not in stock. Built to last! Made in the U.S.A. ! Well-made and nice-looking knife pouch. Quick and secure shipping and professional communication. Thank you.